The lavender is harvested one week before the Fête de Lavande, and as you can see Julien is cutting it with this small scythe. The lavender is wild (not the same as the cultivated varieties we grow in pots or gardens) and is cut from the mountains around Sainte Agnès. The cutting started at 6 a.m. with 20 villagers turning up to help, including my friend, Anita, who took this photograph. Anita lives in Ste. Agnès and apart from being a super photographer, is a fantastic horsewoman, and was a noted breeder of Arabian horses in the past. 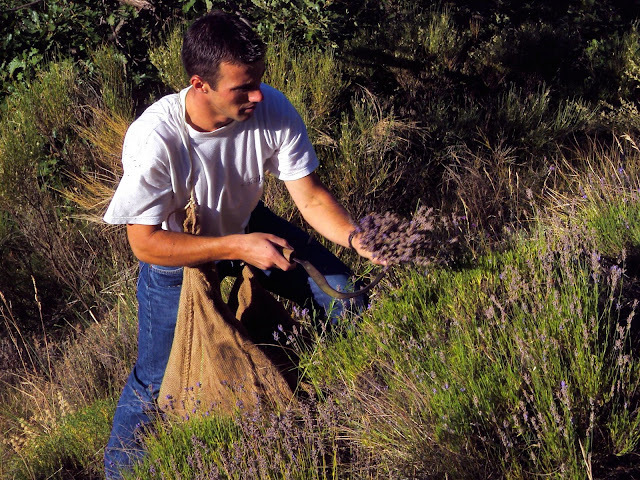 This year 800 kilos of lavender was cut, put into sacks, lugged down to the village (those sacks are heavy) and later spread out in the Salle des Fêtes to dry till the following weekend. Tomorrow we'll see the stills and learn how the essential oil is extracted. Anita has an absolutely charming little house she rents to visitors, so if anyone is coming to Menton on holiday and would like to stay in Sainte Agnès, let me know and I'll put you on to Anita. Eight hundred kilos?? Wow, that's a lot of cutting to do! 6 a.m.? Great light and perfect 'druidic' pose. Lavender reminds me of the houses of both my grandmothers when I was a kid. OOh, now you have really got me tempted (the house), and the view looks very tempting too! (ummm, he's a very attractive lavender cutter, n'est-ce pas??? You can tell he's been spending summer outdoors with the tanned face and arms. I have lavender growing in a huge clump in my back yard and it is covered with all kinds of bees. I cannot imagine wild lavender and how it smells if any difference at all. Nice post. This is a great photograph. I'm just imagining all of that lavender growing wild and then the mass of it cut and drying. The fragrance must be total bliss. It must be the Australian sense of humour ... but I am pleased that Anita was a noted breeder in the past. Very interesting! I guess there's a lot about lavender I'm ignorant about. Thanks for the story. Oh, I just love lavender! My dog eats it...I hope it's not poisonous! Oh goody, I got home in time for yet another fête!! !